Rising towards a single point high in the sky, The National Museum of the Marine Corps is a spectacular green monument paying tribute to the history and values of the United States Marine Corps. 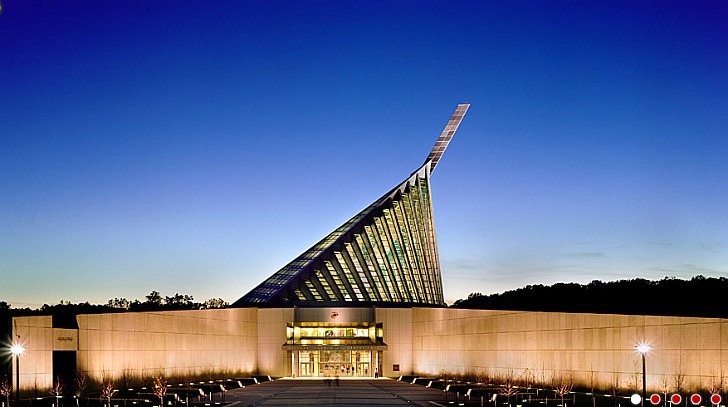 Designed by Fentress Architects, the museum is the primary building of Quantico, Virginia’s Marine Corps Heritage Center, hosting 120,000 square feet of museum gallery space, an orientation theater, office space, gift shop, two restaurants and a stunning green roof. The museum draws over 500,000 visitors a year from all over the world, including foreign dignitaries, tourists, and other military officials. The museum opened on November 10, 2006, in celebration of the Corps 231st anniversary. The design of the National Museum of the Marine Corps was inspired by the moving Rosenthal photograph, ‘Raising the Flag on Iwo Jima‘, an enduring and profound image of five Marines and a Navy corpsman raising the American flag atop Mount Suribachi. 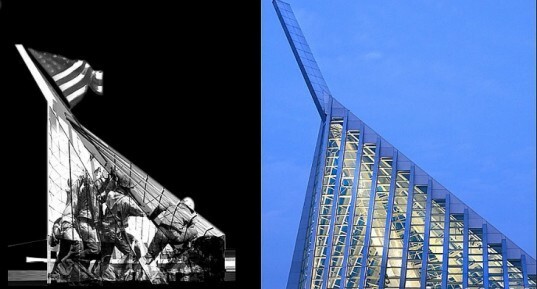 The image, an iconic symbol in Marine Corp lore, formed the basis of the museum’s structure; the form of the building represents the men raising the American flag. The central feature, and a signature element of the museum, is a 210-foot steel mast that anchors the entry lobby, supporting a ribbed, conical skylight. The mast is “a low-slung, circular concrete structure partially covered by a green roof.” The museum is situated on the highest piece of ground, and is visible from Interstate 95 where almost 100,000 cars pass each day. The beautiful structure serves as a lasting tribute to the proud Marines who’ve served in the past, those who serve in the present, and those who will serve in future. Rising towards a single point high in the sky, The National Museum of the Marine Corps is a spectacular green monument paying tribute to the history and values of the United States Marine Corps. Designed by Fentress Architects, the museum is the primary building of Quantico, Virginia's Marine Corps Heritage Center, hosting 120,000 square feet of museum gallery space, an orientation theater, office space, gift shop, two restaurants and a stunning green roof. The museum draws over 500,000 visitors a year from all over the world, including foreign dignitaries, tourists, and other military officials. The museum opened on November 10, 2006, in celebration of the Corps 231st anniversary.